Our third presentation is by all of the Internet Storm Center Handlers that were present (at the time) at SANSFIRE 2009. This is our annual "State of the Internet Panel" presentation. There are no slides for this presentation. As we anticipated in our yesterday's diary, spammers are starting to exploit attention-grabbing headlines of recent celebrity deaths. 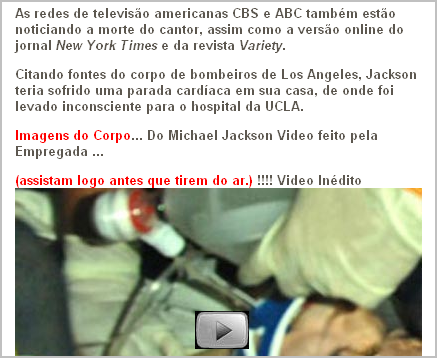 Sophos described one such message, with the subject "Confidential===Michael Jackson", in their blog posting. Today we're starting to see reports of these messages directing viduals to websites that distribute malicious software. The victim was asked to download the "video" file is named "Michael.Jackson.videos.scr" was actually a malicious program--a downloader that would start the infection chain. See the VirusTotal report. Update 1: Websense is reporting that they are seeing this campaign as well in their blog posting, and offer a few additional details. Update 2: Here's the ThreatExpert report on the downloader, detailing the files it attempts to install on the victim's system. Liked this note? Tweet it! A programmer can define TLS callback functions, which were designed mainly to initialize and clear TLS data objects. From the malware author's perspective, the beauty of TLS callbacks is that Windows executes these functions before execuding code at the traditional start of the program. How Can TLS Callbacks Confuse Debuggers and Analysts? Analysts often examine the a malicious program's code by starting with the instructions located at the Entry Point of the executable. 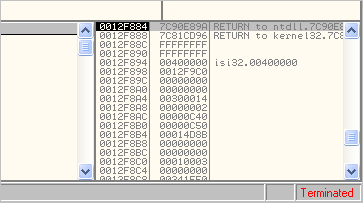 The Entry Point is a field in the PE header that stores the address of the "first" instruction in the program that Windows is supposed to execute; debuggers typically take us to that instruction after loading the executable. TLS callback functions allow malware authors to execute malicious code before the debugger has a chance to pause at the traditional Entry Point. This allows malware to infect the system or disable the debugger before the analyst has a chance to look at the sample's code. Consider the TLS callback technique employed by the Nadnadzzz bot about a year ago. If you load the bot's executable into OllyDbg, you expect to have the debugger pause at its entry point. Instead, OllyDbg seems to immediately say that the process terminated. What happened? You just infected yourself! The problem is that before OllyDbg had a chance to pause at the traditional Entry Point instruction, it executed a TLS callback function. Configure the debugger to pause on the system entry point, instead of the traditional program entry point. Identify the address of the TLS callback function, instead of the traditional program Entry Point. Set the breakpoint on the TLS callback function, then run the program if you wish. If using OllyDbg, you can tell it to pause before TLS callback by going to Debugging options > Events. By default, it's set to pause at "WinMain (if location is known)." Instead, set it to pause at "System breakpoint." This will allow you to control the program before TLS callback functions execute. Now you will have a chance to set the breakpoint on the TLS callback function. You need to find it first, though. Ilfak Guilfanov describes a convenient way to do that with IDA Pro in his blog posting. To locate the TLS callback function, load the malicious executable into IDA Pro, then press Ctrl+E to view the executable's entry points. The address of the TLS callback function should be among them. Now you know where to start debugging or otherwise analyzing the program's code. You can do this in IDA Pro. If you prefer OllyDbg, you can return to OllyDbg, and load the malicious program; OllyDbg will now pause at the "system entry point" in ntdll.dll. Press Ctrl+G and enter the address of the TLS callback function, which you located via IDA Pro; set a breakpoint there and continue the analysis. If you have other tips and examples of TLS callbacks used by malware, please let us know. aa.zzz.qqq.119 - - [24/Jun/2009:08:37:19 -1000] "GET HTTP/1.1 HTTP/1.1" 400 26 "-" "Toata dragostea mea pentru diavola"
aa.zzz.qqq.119 - - [24/Jun/2009:08:37:19 -1000] "GET /admin/js/keyhandler.js HTTP/1.1" 404 26 "-" "Toata dragostea mea pentru diavola"
aa.zzz.qqq.119 - - [24/Jun/2009:08:37:20 -1000] "GET /admin/pma/js/keyhandler.js HTTP/1.1" 404 26 "-" "Toata dragostea mea pentru diavola"
aa.zzz.qqq.119 - - [24/Jun/2009:08:37:21 -1000] "GET /admin/phpmyadmin/js/keyhandler.js HTTP/1.1" 404 26 "-" "Toata dragostea mea pentru diavola"
aa.zzz.qqq.119 - - [24/Jun/2009:08:37:21 -1000] "GET /db/js/keyhandler.js HTTP/1.1" 404 26 "-" "Toata dragostea mea pentru diavola"
aa.zzz.qqq.119 - - [24/Jun/2009:08:37:22 -1000] "GET /dbadmin/js/keyhandler.js HTTP/1.1" 404 26 "-" "Toata dragostea mea pentru diavola"
aa.zzz.qqq.119 - - [24/Jun/2009:08:37:22 -1000] "GET /myadmin/js/keyhandler.js HTTP/1.1" 404 26 "-" "Toata dragostea mea pentru diavola"
aa.zzz.qqq.119 - - [24/Jun/2009:08:37:23 -1000] "GET /mysql/js/keyhandler.js HTTP/1.1" 404 26 "-" "Toata dragostea mea pentru diavola"
aa.zzz.qqq.119 - - [24/Jun/2009:08:37:23 -1000] "GET /mysqladmin/js/keyhandler.js HTTP/1.1" 404 26 "-" "Toata dragostea mea pentru diavola"
aa.zzz.qqq.119 - - [24/Jun/2009:08:37:24 -1000] "GET /typo3/phpmyadmin/js/keyhandler.js HTTP/1.1" 404 26 "-" "Toata dragostea mea pentru diavola"
aa.zzz.qqq.119 - - [24/Jun/2009:08:37:24 -1000] "GET /phpadmin/js/keyhandler.js HTTP/1.1" 404 26 "-" "Toata dragostea mea pentru diavola"
aa.zzz.qqq.119 - - [24/Jun/2009:08:37:24 -1000] "GET /phpmyadmin/js/keyhandler.js HTTP/1.1" 404 26 "-" "Toata dragostea mea pentru diavola"
aa.zzz.qqq.119 - - [24/Jun/2009:08:37:25 -1000] "GET /phpMyAdmin/js/keyhandler.js HTTP/1.1" 404 26 "-" "Toata dragostea mea pentru diavola"
aa.zzz.qqq.119 - - [24/Jun/2009:08:37:25 -1000] "GET /phpmyadmin1/js/keyhandler.js HTTP/1.1" 404 26 "-" "Toata dragostea mea pentru diavola"
aa.zzz.qqq.119 - - [24/Jun/2009:08:37:26 -1000] "GET /phpmyadmin2/js/keyhandler.js HTTP/1.1" 404 26 "-" "Toata dragostea mea pentru diavola"
aa.zzz.qqq.119 - - [24/Jun/2009:08:37:26 -1000] "GET /pma/js/keyhandler.js HTTP/1.1" 404 26 "-" "Toata dragostea mea pentru diavola"
aa.zzz.qqq.119 - - [24/Jun/2009:08:37:27 -1000] "GET /web/phpMyAdmin/js/keyhandler.js HTTP/1.1" 404 26 "-" "Toata dragostea mea pentru diavola"
Modsecurity or suhosin should help you out keeping this away from your installation. PHPMyadmin should probably only be available from the internal network or limited external sources. So for most of you this shouldn't be an issue. If you do have some captures of what happens when there is a compromise, please use the contact form to let us know.